For the past 73 years I have received frequent questions about the authenticity of my WWII experiences at the age of 15. 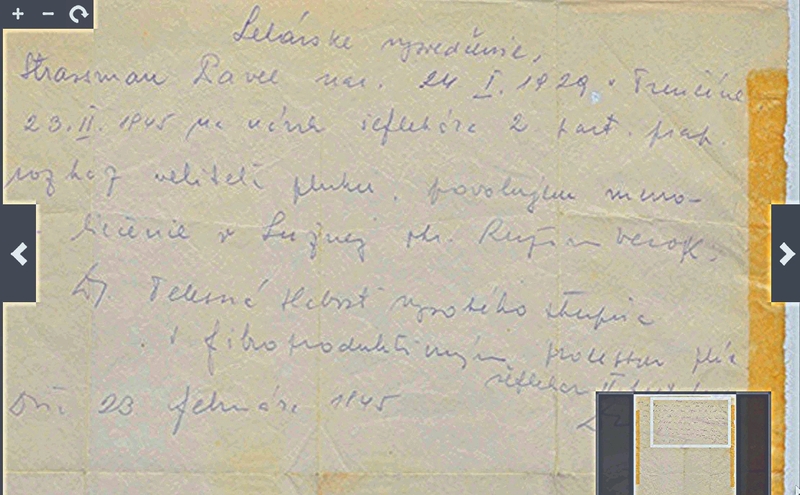 It is the purpose of this blog to include copies of several original documents that describe my partizan services in 1944 and 1945. I joined a small unit that was commanded by two Russians who had recently parachuted into Slovakia to recruit civilians for support of a recent uprising of about a third of the Slovak army. The commander of this nine person unit was a one armed "Batko". The second Russian was a radio operator who could receive nightly instructions from the partizan command in Kiev. The purpose of our unit was to interfere with the railroad traffic on one of two tracks that crossed the mountain passes to connect German forces between the Hungarian and Polish plains. Batko's objective was to recruit civilians that would then engage in dynamiting the rail tracks. I became one of their earliest recruits as I claimed good knowledge of the local landscape. 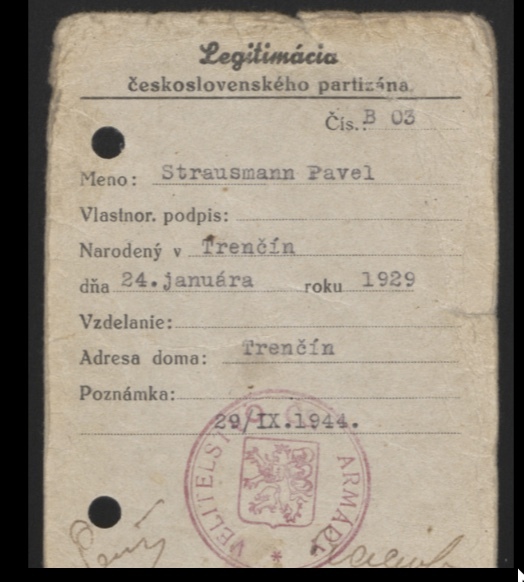 The Slovak army had supported the Germans since 1939 and was seen as traitors by the Russians. Some Slovak officers joined the uprising to become associated with a newly formed Czechoslovak Army, that hoped to be identified as an "Allied" force. 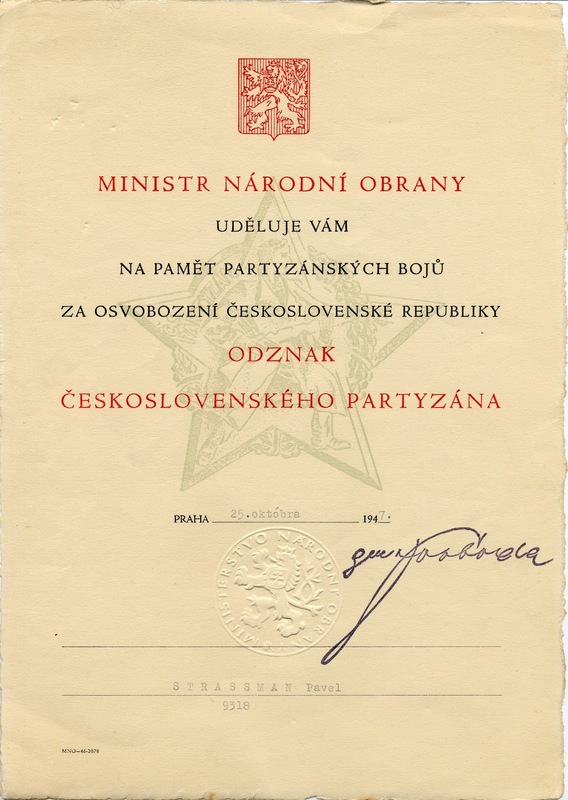 Though the Russians remained committed to waging partizan warfare, the new Czechoslovaks deployed forces for conventional combat which was a complete failure. 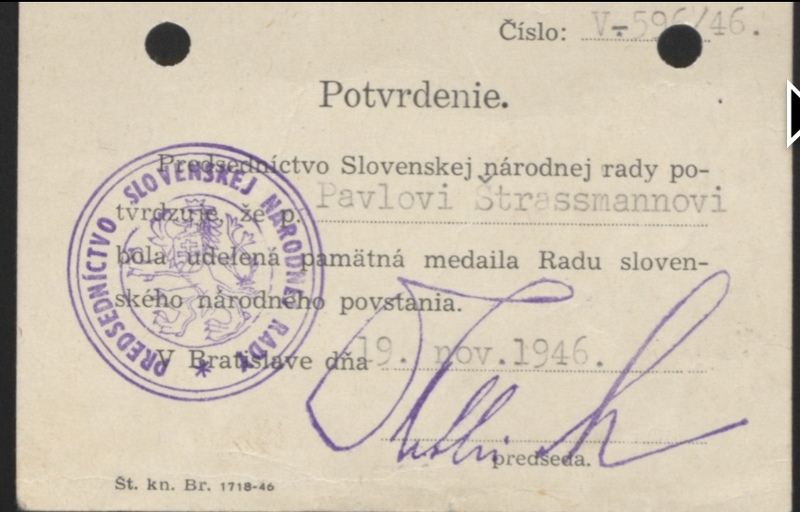 For cover, and as a charade, my Russian commanders allowed Czechoslovak officers to sign us into the force so that reports to London could claim a larger popular uprising. For reasons I do not know, I have always kept this ID card in my pocket though it would become a death sentence if caught. Somehow, this card was my assurance that I would never be captured alive. These cards are rare because they were always discarded after the failure of a short-lived uprising. 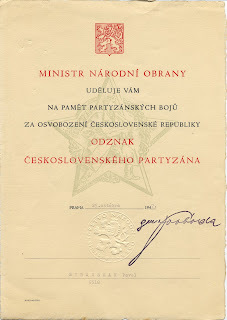 After the war the Czechoslovak bureaucracy started authenticating partizan claims because they became the basis for receipt of property from collaborators, for generous pensions and for political acceptance as the participation in partizan combat become a prerequisite for government positions. The description summarized my service in a "mine laying squad", additional three instances of railroad disruption and combat services in two named battlegrounds. With the exception of a one week medical leave my records show continued partizan service, including participation in combat missions. 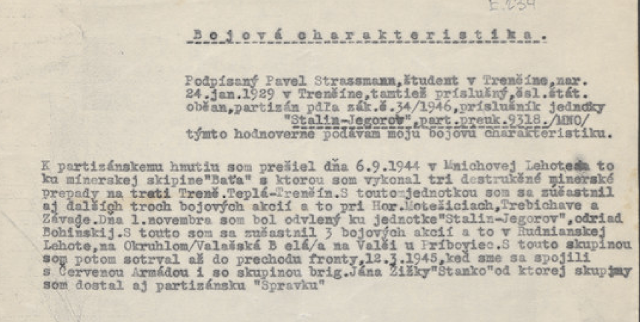 My documentation is unique since most of the partizan units were improvised without a formal command structure that fit into WWII operations. 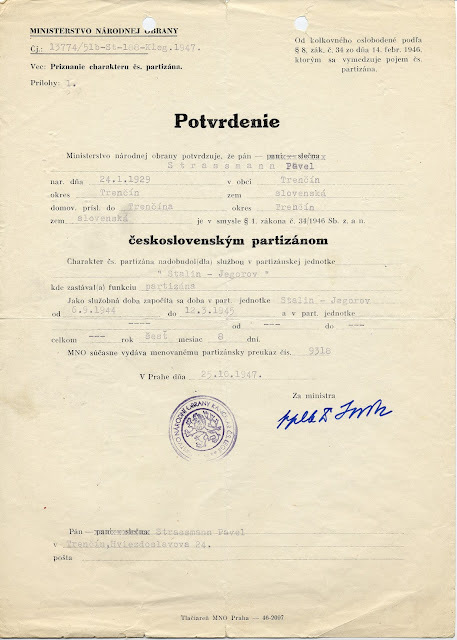 There are many civilians who claim participation in partizan warfare but do not have comparable records that would attest as to their activities. Only a small fraction of fighting Jews can be recognized as authorized WWII combatants.